For freelancers and small businesses. No credit card required and no contracts to lock you in. Try it Free. send them to your clients and get paid faster online. Create an unlimited number of professional invoices for free and send them to your clients with one click. This is how you can improve your cash flow. If needed, you can export your invoices to PDF for later use. Keep a list of your clients sorted in one place. Check the user-friendly interface and enter as much information as possible for your clients. When you create your clients’ profiles, choose from the multiple currency support for each client. Prepare quotations for your clients and convert them to invoices. Make sure your clients are satisfied with your quotation before you prepare them an Invoice. Use the possibility for unlimited estimates. Run reports to gain insight on your profit and loss statements. Take a closer look to your invoicing history. Have a clear picture on your expenses and your taxes. Get paid instantly from anywhere in any currency. Improve your cash flow. 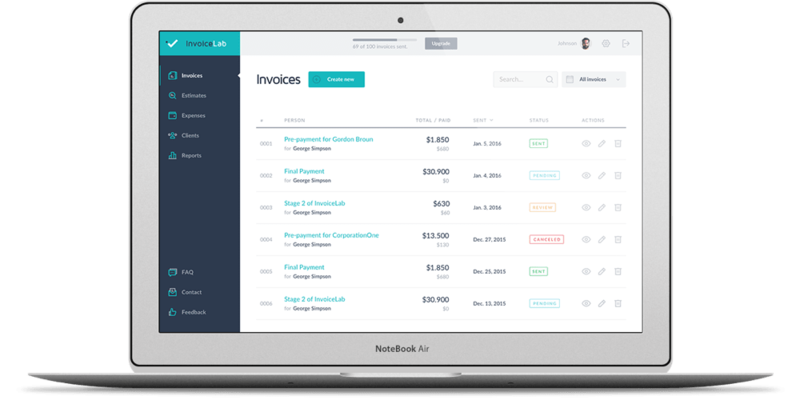 The interface allows you to track the Invoices that have been sent or paid, and which ones are due for payment. Free Paypal integration for all InvoiceLab plans. More integrations coming up soon.